Beware the Haunted House and enter if you dare, there are unspoken treasures lining the walls within. Click here to play! The creepiest house in all the slots is waiting for you to begin the ghoulish spinning! The Haunted House is the Wild symbol, and can therefore be subbed for any other logo on the reels in order to finish off the best combinations. Land all five on an active pay line to earn 5000 times your initial wager. 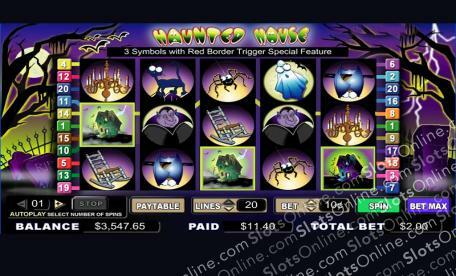 The Door is Scattered and can show up anywhere on the reels to earn a payout, while the special Haunted House feature will allow you to enter a unique bonus round. Ghosts, Mummies, and Vampires will all help you win excessive amounts of cash, with some paying out up to 2500 coins at a time. Win yourself some brilliant cash prizes at the scariest online slot: Haunted House! The Door is Scattered and can show up anywhere on the reels in order to earn a payout. Haunted Houses act as Wilds and Substitutes, meaning that they can pay out ridiculously well, as well as become any other symbol, except scatters and bonuses, in order to complete combos. Spin up the correct combination of Red Borders and Haunted Houses to activate the Haunted House bonus game.